Getting a high score on the Bar Exam is crucial for your law future and career. 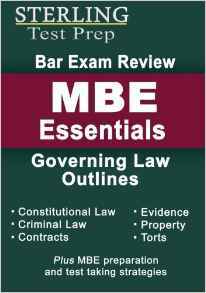 The MBE section of the Bar Exam has many different options for test prep books. Finding the right guide for you can prove to be very difficult. 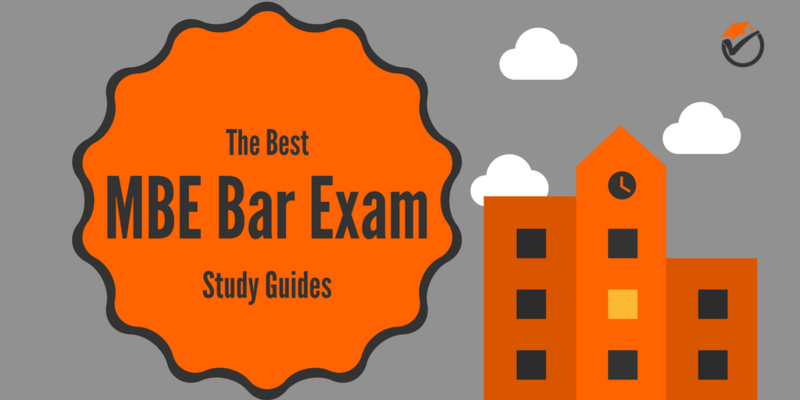 Because of these reasons, I have created this list of the best MBE Bar Exam study guides. All of the info below, collected over many hours of research, should make it very easy to choose which is the best prep book to prepare for the MBE. Ready to see which guides came out on top? 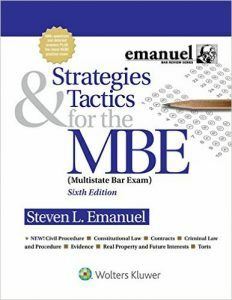 Strategies & Tactics for the MBE is our best overall and best value prep book on our list of the top rated MBE Bar Exam study guides. One thing that really makes this study guide stand out are its unique strategies and tactics. These strategy and tactics are not found in any other prep book on our list. These tips include things like how subtle differences in wording can completely change the meaning of an answer and strategies for rewording questions to make them easier in your mind to analyze. These tactics really allow you to tone down the difficulty of the test, easing your nerves on test day. Another positive about this review book is the number and difficulty of the practice questions. Practice questions are always very useful to study for the test since they can help prepare you for what you’ll actually see on test day. The good thing about Strategies & Tactics is that the questions that they provide for practice are very similar to what you’ll see on test day. Some prep books make up their own questions, but they are not very similar to what actually is on the test. This prep book does not have this issue. One main weak point of Strategies & Tacticsis that there are some typographical errors included within the chapters. These errors can sometimes be distracting when you are going through the different subjects of the test. Although Strategies & Tactics has this one flaw, it’s many strengths make up for it. 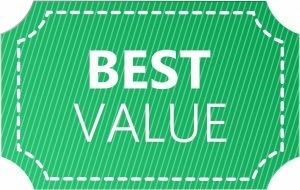 Because of this we rank Strategies & Tactics for the MBE as our best overall and best value prep book on our list of the top MBE Bar Exam prep books. - Practice questions are very "test-like"
PMBR MBE Practice & Strategies is our 2nd best overall prep book on our list of the top MBE Bar Exam review guides. One main positive about this prep guide is that it is concise, short and to the point. This conciseness really saves you time because this prep book cuts out all of the fluff and only focuses on topics that you really need to know for the test. Although the subject review is concise, the answer explanations are in-depth and thorough. Learning from your mistakes is one of the best ways to improve your score on the test in this prep guide really allows you to do just that. Another strong point of this study guide are the test tips and strategies included within. On a lot of exams the test makers will try to slip you up and throw you curveballs. This book’s test tips and strategies will allow you to slip past all of the tricks the test makers will throw at you. One main flaw of this study guide is that the subject review is not as in-depth as other guides. At only 624 pages, PMBR MBE Practice & Strategies does not have a lot of length to comprehensively review all of the topics. Although with this one flaw, this review book makes up for with all of the other content included in the book. 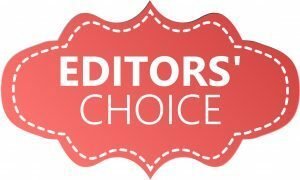 Because of this we rank PMBR MBE Practice & Strategies as our 2nd best overall prep book on our list of the best study guides to prepare for the MBE. 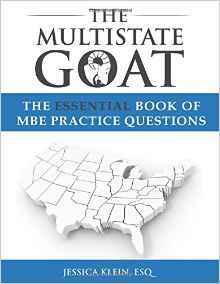 The Multistate Goat is our 3rd best overall prep book on our list of the best MBE Bar Exam review guides. This prep guide focuses mainly on practice questions and not in depth overview. Because of this, the practice questions are a lot better than other prep guides on our list since that is the main focus. Also, the answer explanations for these questions are very in-depth. This allows you to learn from your mistakes, thus providing an easy way to increase your score on test day. All the questions in this prep book are authentic and licensed by the test. This means that they are very similar to what you’ll see on test day and are of the same difficulty. Another strong point of The Multistate Goat is that all of the included practice questions are nicely organized. This allows you to go through question after question in a single subject or topic matter and allows you to focus your study time on points of weakness. Also, the end of chapter explanations were great confidence builders because you know that you have learned everything that you need to know for the test. This really eases your mind on test day knowing that you have everything covered. The one main weakness of The Multistate Goat, as mentioned before, is that there is no in-depth concept review. At only 484 pages, this study guide does not have enough length to go over all the practice questions and to provide a comprehensive review. If you’re looking for an in-depth review on the subjects, you may need to pick up a supplement prep book. Because of this we rank The Multistate Goat as our 3rd best overall prep book on our list of the top MBE Bar Exam study books. 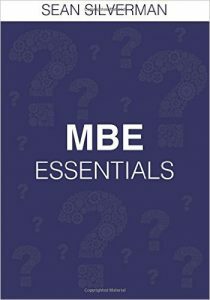 Sterling Bar Exam Review MBE Essentials is our 4th best overall and budget pick prep book on our list of the top rated MBE Bar Exam preparation books. This prep guide is mainly focused on the concept essentials that you are need for the test and not on practice questions and tests. One strong point about Sterling's that it condenses the material in an orderly and easy to understand format. This makes it really easy to pick up the book from where you left off and to consistently conquer all of the material that you will need to know for the test. Another positive about Sterling's is that it outlines and describes principles of substantial law. Substantive law strategy is a very simple tactic to determine what the correct answer is for nearly every question on the test. Knowing this strategy really allows you to conquer all those difficult questions that you have no idea on how, at least giving you an educated guess. One main weak point of Sterling's is that there are some typographical and grammatical errors throughout the book. Some of these errors may make the overview misleading in that it tells you one thing but really the law states that as it is actually the opposite. These small mistakes can really add up over time. Also, since his book is geared more towards review, it is not focused on practice tests and questions. If you’re looking for sample tests and questions you may need to purchase a supplemental guide. Because of this, we rank Sterling Bar Exam Review MBE Essentials as our fourth best overall, but budget pick prep book on our list of the top ranked MBE Bar Exam practice books. 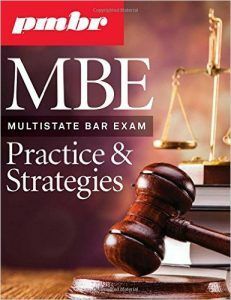 MBE Essentials is our 5th best overall prep book on our list of the best MBE Bar Exam study books. This prep guide goes over a question and answer type format to help you study for the test. Like the previous book on our list, Essentials is intended to teach the substantive law which is a method far more effective than the way other study guides teach the test. Since the study guide is focused mainly on questions and answers, the answer explanations are very up to snuff and comprehensive. You will never be left wondering why you got a certain question wrong. The justifications are also described in layman’s terms, making it easy to understand why certain answers are correct and why others are incorrect. Another positive about the question-and-answer format is that it makes it very easy to pick up the book where you left off and start studying straightaway. It is a great way of learning without it being very strenuous. It also allows you to study in small chunks, for example between classes or on your way home from work or school on the bus or subway. At only 140 pages, Essentials does not have enough length to thoroughly review the topics. This prep book mainly just asks questions and gives answers. If you are looking for all-inclusive subject review you may need to purchase a different guide. Because of this we rank MBE Essentials as our 5th best overall prep book on our list of the top rated MBE Bar Exam study guides. 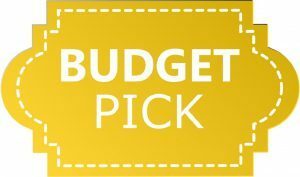 Unless your study budget is very stressed, just buy Strategies & Tactics for the MBE. This study is is our top pick and the best value study guide on our list. If your budget is very tight, then pick up Sterling Bar Exam Review.